This year was a big one for Disney stars. Hannah Montana/Miley Cyrus blew up after her 3D tour movie "The Best of Both Worlds" hit screens in the spring. Hot on her heels were the Jonas Brothers, who've been burning up the screens and the charts; and who can forget the kids of High School Musical? We know we can't! We've been singing their catchy soundtrack ever since we saw the film in theaters back in October. To help usher in the new year, we've decided to go back and highlight the trends that made 2008 the crazy year it was! While we're all for a new year, and can't wait to see what 2009 will bring us, we think it's best to pay homage to what came before! You can bet your bottom dollar that the number one wish on your daughter's list this year is to be transformed into teen pop sensation Hannah Montana. You may not be able to turn her into someone else, but you can do the next best thing: get her a slew of Hannah Montana costumes and put them under this year's tree! She will love our Hannah Montana deluxe costume. 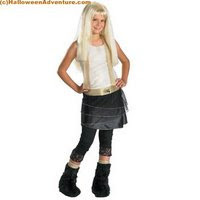 Hannah Montana costume includes top, skirt, and detachable belt with logo, scarf, black leggings, fuzzy bootcovers, and wig. Though Hannah and the Cheetah Girls never perform together on the Disney Channel, there’s a first time for everything. Unite the neighborhood and gather a group of Disney girls to trick or treat together. Snag multiples of each costume, and you’ve got yourself a super girl group! We also have a Hannah Montana Outfit in Gold. This one is perfect for a girl who loves all that glitters. Get the best of both worlds in an outfit that includes: Jacket, top, leggings, belt, and wig. Our Hannah costume also comes in Pink. This costume is perfect for girly girls, and is a nice compliment to the gold Hannah costume, as well as the pink Cheetah Girls costume! Includes: Jacket, top with attached vest, pants, belt, and bracelets. Gather the girls together and rock it out Halloween style! 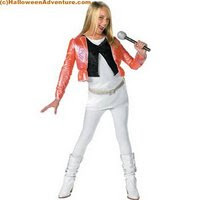 Remember, Hannah Montana costumes are some of the most popular costumes we have, so make sure you get on top of your Halloween costume hunting as soon as possible in order to snag your costume before it sells out! Log on to Halloween Adventures now!